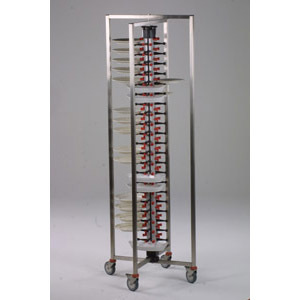 This mobile plate rack, also known as a stacking plate tree is a collapsible jack stand is ideal for banquet serving and banquet plating. 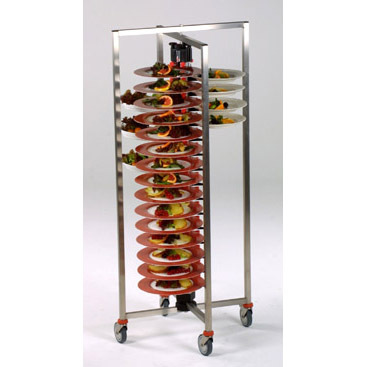 It can hold up to 84 dishes and is the economy priced model for our budget minded customers looking for a mobile plate stand. 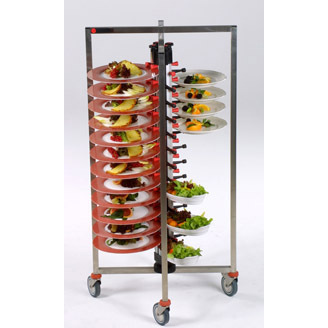 Specifically designed for rentals, catering companies and companies that are located in small quarters, our collapsible plate stand is available in coated and stainless steel in the 84-plate jack rack, 48-plate jack rack and 60-plate jack rack versions. This mobile plate rack is an 84-plate model on a folding kitchen rack that can be hung on a wall or put in a corner for storage. You can save space twice with this model, first when in use with 84 plates and then when not in use. Powder coated steel frame requires no maintenance. Cleaning can be done with a high-pressure washer or with a brush and soap suds. A protective cover for the PM84-135 plate stack is available as an optional item to protect against odors and to prevent the dish contents from drying out. 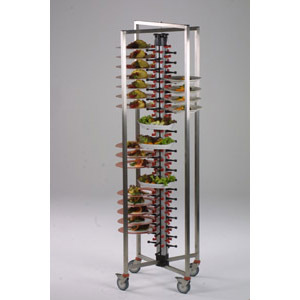 If your wondering if we have a mobile plate rack model that can fit into nearly any bottom line, this is it. Our PM84-136 is comparable to the JackStack® JS072 in material but holds 84 plates instead of 72. Our PM84-136 84 plate stand adjusts to fit nearly any dinner plate size, if used properly you can tilt our 84 plate racks up to a 20 degree angle, fully loaded, without dropping any of the 84 plates. That is not something we recommend you try with our competition. PM84-136 plate stack is made specifically to help our customers with giant needs and small budgets.